The public has been urged to show love and compassion to prison inmates and other people who are considered to be condemned or outcasts. This is because every human being is loved and cherished by God, no matter what the perceptions of humans might be. 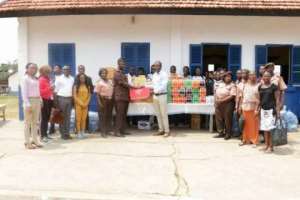 Dr Kofi Osei-Kusi, the Founder and Leader of the Osei-Kusi Foundation, established to invest and mentor the youth, said this when his organisation made a donation of assorted items worth about 10,000 Ghana cedis to the Senior Correctional Centre on Wednesday in Accra. The donation was to commemorate this year's Valentine's Day, which is celebrated on February 14. He said whilst correctional facilities only reflected the fact that humans were fallible, many viewed inmates of such facilities as evil doers who did not deserve any compassion. Dr Osei-Kusi said this was unfortunate because every human being was cherished by God and it was a blessing to show love and compassion to everyone. 'Today is Valentine's Day and although you may have been accused by people, you are still loved and cherished,' he told the inmates. Dr. Osei-Kusi encouraged people to show more love through giving, especially to the needy. Mr Alhassan Nahii, Officer in Charge of the Senior Correctional Centre, described the donation as most needed and said he was overwhelmed by the gesture. He expressed the hope that more individuals and organisations would donate to the centre to improve the lives of the inmates. Mr Nahii, who is also the Deputy Director of Prisons and the Greater Accra Regional Commander of Prisons, said there was a wrong perception by the public that the Senior Correctional Centre housed criminals. He said on the contrary, the centre was only a correctional facility, which churned out reformed people, ready to integrate into society. Mr Nahii said assistance the facility, therefore, was another way of ensuring a better society in the long term. The Senior Correctional Centre, located at Roman Ridge in Accra, caters for young offenders and juveniles and trains them in several vocations such as moral education and Information and Communication Technology.